Junkers (pronounced Yoonkers) is one of three watch brands owned by Pointtec Electronic GmBH, a German company founded in 1987. The other two brands offered by Pointtec are Zeppelin and Maximilian Munchen. Pointtec began by designing and producing private label promotional watches for German multi national corporations such as Borsch, Siemens and VW. In 1997 Pointtec licensed the rights to the Junkers name from the estate of Hugo Junkers, the famous German aeronautical engineer who created the first all metal airplane, making use of corrugated metal sheets. Thus the Junkers brand was born. 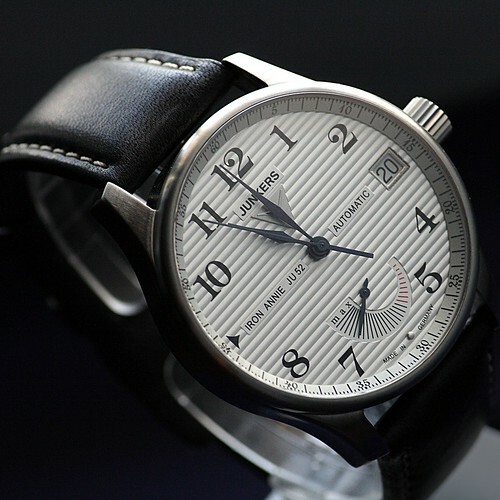 The typical Junkers watch combine historical aviation features with modern mechanical and electronic watch technology. 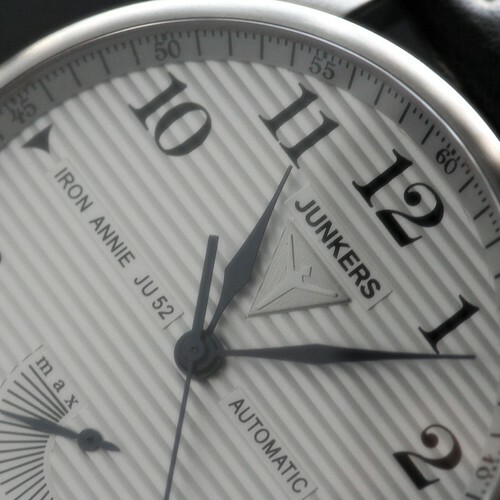 The Junkers Iron Annie JU52 is an automatic watch with power reserve feature. From the name it is obvious that the watch is inspired by aviation history, in particular the famous German airplane Junkers JU52. The JU52 was designed in 1930, and it incorporated corrugated metal skin to strengthen the plane structurally. The Iron Annie, as the JU52 was also known, was produced by Junkers from 1932 to 1945, and it saw both civillian and military service during that period. The Junkers JU52 watch traces its roots to the historical airplane and adopts the corrugated metal sheet skin into the dial design. This is the single most important element that differentiates the Junkers watch from other watches. ETA’s new caliber Valgranges A07.161 is the mechanical engine that drives the watch. ETA developed the Valgranges movement, based on the workhorse Valjoux caliber, to meet the growing demand for larger watches. Compared to ETA’s workhorse calibers, the 2824 and 2892 which are both 25.6mm in diameter, the 36.6mm diameter of the Valgranges allows the caliber to be cased inside larger watches without the use of oversized spacer rings. The A07.161’s larger diameter allows the incorporation of a “big” date disc, providing legible date indication without the need for the magnifier on the watch crystal. 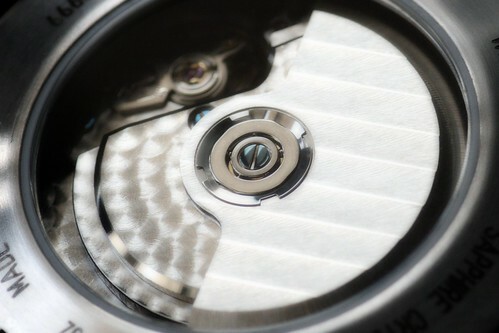 In addition the caliber also provides the useful power reserve indicator function at the six o’clock position. Being based on the legendary Valjoux caliber, the Valgranges A07.161 incorporates many of the Valjoux’s desirable features. However it also inherited the infamous Valjoux “wobble”, a minor point, but one worth noting. As the photos below show, the movement finishing is satisfactory. The plates and bridges are decorated with circular graining or perlage pattern and the rotor is finished with geneva waves or cote de geneve decoration. Chemically blued screws are used in the throughout the movement. The case is 42mm in diameter and 15mm thick. Lug to lug the watch measures 49mm. It is made of stainless steel with a matt brushed finish. 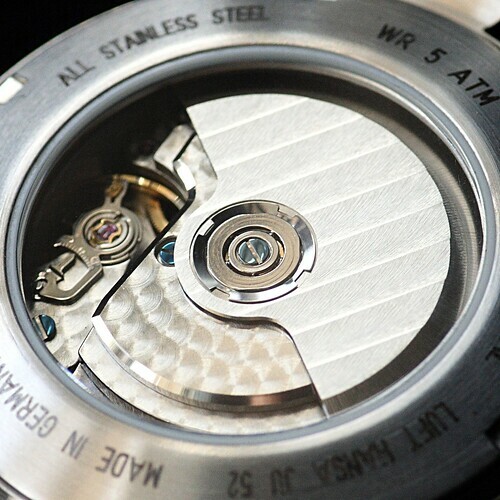 The screwed-in case back comes with a display glass which gives a clear view of the Valgranges A07.161 movement. The watch is rated to 5 ATM water resistance. The watch is equipped with a scratch resistant sapphire crystal. The sapphire crystal is slightly domed but unfortunately is not AR coated. The large dial is white and legibly printed with arabic numeral hour markers (less the numbers 3, 6 and 9). There is an outer ring lined with the minute markers in 5 minute increments. 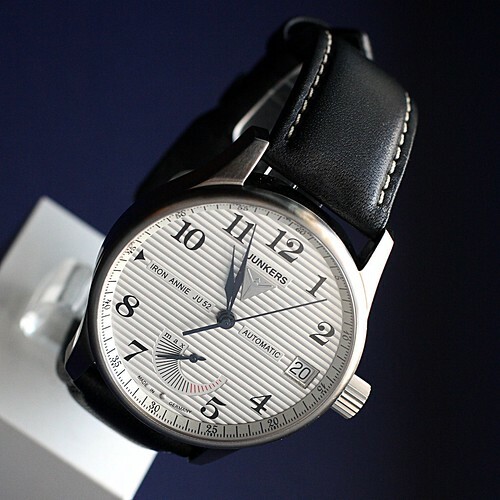 The dial itself is engraved with a corrugated metal sheet finish inspired by the corrugated metal skin on the Junkers JU52. The Junkers label and logo are located below the twelve o’clock position. At the nine o’clock position is printed “Iron Annie JU52”. A big date window is located at the three o’clock position. 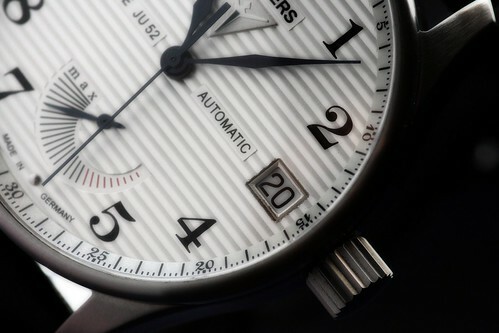 The large diameter of the Valgranges caliber allows the date window to be placed right at the edge of the dial. The power reserve indicator is situated at the six o’clock position, and below that is the finely printed “Made in Germany” label. The hour markers are not coated with luminescent material which will be a point of concern if one needs to read the time in the dark. The hour, minute and second hands are rightly proportioned and are painted deep blue. The hour hand reaches to the arabic numeral hour markers and the minute hand is long enough to reach the outer minute markers. The unsigned crown is non screw down type and is nicely knurled. 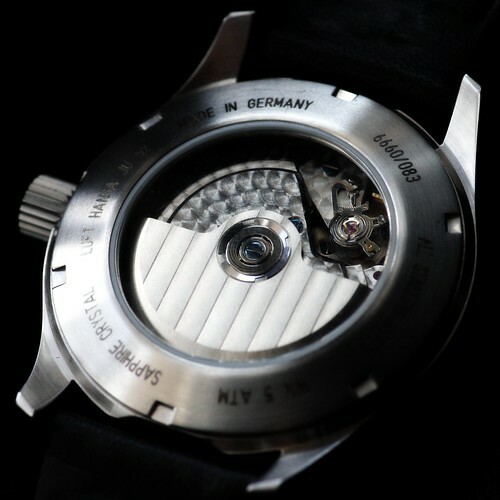 Both features facilitate manual winding of the watch. The watch comes with a black genuine leather strap with contrast stitching. The buckle is the tang type and is unsigned. 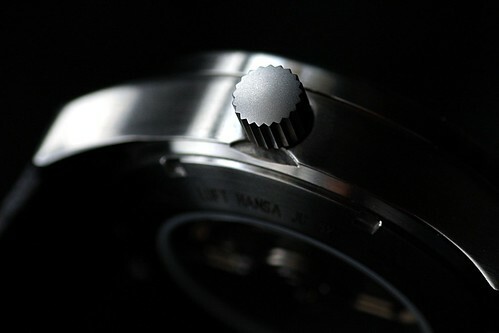 The lugs are gently down from the watch case but are finished smoothly with no sharp edges. The lug width accommodate 22mm size straps which are attached using spring bars. The ETA A07.161 is a relatively new caliber, first introduced in 2006. Despite its many attractive features, this caliber is still not as commonly available as the workhorse calibers 2824 and 2892. Junkers offers this exciting new caliber in the Iron Annie JU52 model, nicely packaged in a good quality watch with an attractive price tag. 1. Is the watch mechanism quartz driven or it needs winding? 2. As the watch is water resistant to 5 at and is equiped with leather strap, could I sweem in a fresh water swiming pool? I believe the watch you bought is a Junkers 6640-2. 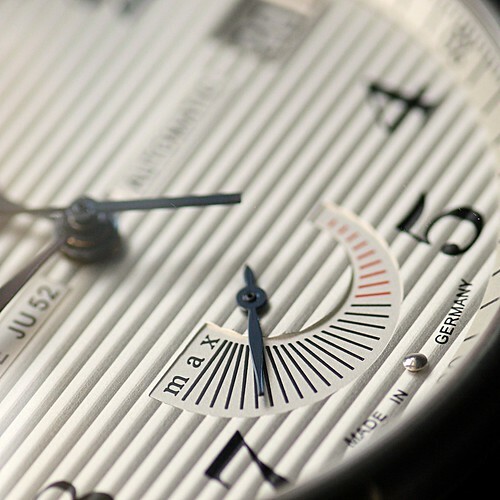 Here’s a link to the manufacturer’s website describing the watch in detail. It is equipped with a Ronda quartz movement, so it’s not a mechanical watch. The minimum recommended water resistance for swimming is 100m.